Shelley Weisberg is a botanist who delights in exploring mountain wildflower meadows on her hands and knees. She has a Master’s Degree In Plant Ecology from Humboldt State University and worked as a backcountry ranger leading the early days of the plant restoration program at North Cascades National Park. Shelley has spent the last sixteen years working in local nurseries, specializing in native plants. 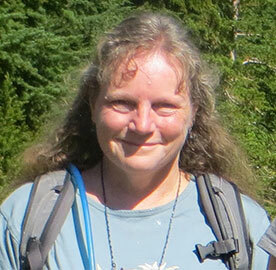 She currently works in Bellingham at Fourth Corner Nurseries, a large native plant nursery. She has a business, Moonstone Garden Design, and has designed a number of private gardens, as well as four rain gardens and street side planting beds for the City of Bellingham. Shelley has two children who are out in the world creating their own adventures.